Gov't says it found 'no evidence' companies were charging workers money. B.C. announced it would investigate the case after The Tyee discovered in October recruiters in China are offering mining positions in B.C. for a $12,500 fee, which is illegal under provincial law. Vancouver – BC’s Building Trades’ unions say the actions of HD Mining in rejecting many highly qualified, very experienced Canadian miners from even being considered for jobs at the Chinese-owned company’s BC coal mine development projects are “outrageous and offensive”. 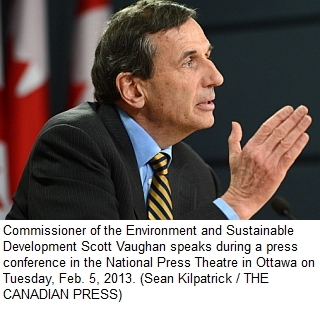 A vast disparity exists between Ottawa's rush to develop Canada's natural resources and the rules and regulations governing that development -- resulting in major environmental and economic risks, an audit from Canada’s environment commissioner has found. A half billion tons of coal and just 7,000 workers. Is it time to put the brakes on runaway coal development? The coal industry is booming in British Columbia, with a dozen new mines proposed around the province and the port of Metro Vancouver making expansive plans to become the biggest coal-exporting facility in North America. In an editorial published in the Nov. 30 edition of The NEWS, John Harding expressed some very interesting ideas for thought concerning the shellfish industry. VANCOUVER - A mining company that has hired hundreds of temporary workers from China for its northern B.C. coal mine advertised those jobs in Canada for $10 to $17 less than what is paid for similar work at a nearby mine, a lawyer representing two unions told a federal court judge on Friday. Several issues ago I read a letter to the editor telling how great the mining industry has been to the Comox Valley over the years. Revised thermal-coal mine back on table in B.C. 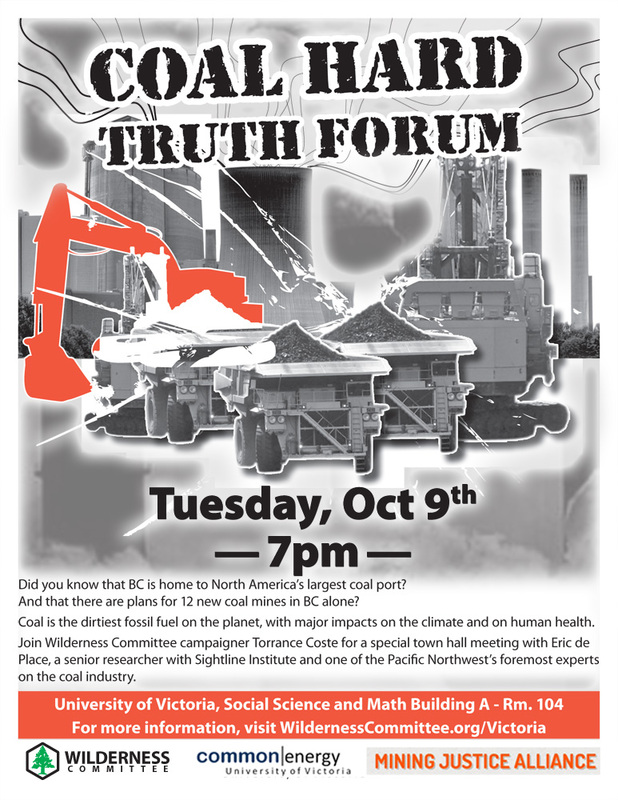 Wendy Stueck, Globe and Mail, Nov. 06 2012VANCOUVER — A coal project shelved after B.C. introduced legislation that effectively nixed coal-fired electricity plants is back on the front burner, this time as a mine-only operation that does not include an electricity component. The study of international evidence showed increased rates of cancer, heart, lung and kidney disease, as well as birth defects, in communities near coal mines and coal-fired power stations. The researchers analysed 50 studies from 10 countries, including the US, the UK and China. Are 100 English words and dead miners really what we want? The truth is starting to come out about Compliance Energy and, as we have said all along, this is not about jobs for local people as John Tapics, president of Compliance Energy, would have us believe. Heavy fee, promise of eased immigration part of package, Tyee investigation reveals. Chinese miners being recruited to work in Canada are paying more than $12,500 CAD for the privilege, The Tyee has learned, and their actual wages are less than those advertised. The hundreds of “temporary” foreign workers coming from China starting this autumn to work in northeastern B.C. coal mines will end up staying for years, if not decades, predicts the president of a B.C.-based employment agency. BURNABY, BC, Oct. 11, 2012 - Premier Christy Clark and Jobs Minister Pat Bell have misled British Columbians about local job creation in Chinese-owned coal mines, says the United Steelworkers (USW), which represents miners in B.C. BC Jobs Minister Pat Bell asserted on The Bill Good Show on CKNW today that the United Steelworkers "throws arrows, and fails to come to the table with constructive solutions." It's a false statement that doesn't stand up to the facts. As the attached 3 letters demonstrate, the USW has been attempting to come to the table to meet with the BC Government to discuss concerns and find solutions for well over 10 months. 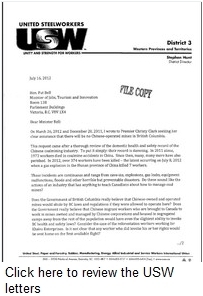 BURNABY, BC - Highlighting the dismal and deadly health and safety record of the Chinese coal mine industry, the United Steelworkers (USW) is urging B.C. 's Jobs Minister to abandon plans for Chinese-operated coal mines in British Columbia. The more you look at the Environment Ministry's handling of the Morrison Mine proposal, the more unusual it gets. OTTAWA — The first of a group of 200 temporary Chinese workers approved by the federal government will start arriving in B.C. in coming weeks to work in the burgeoning northeast coal industry, a mine project spokeswoman confirmed Tuesday. It's a little startling to see the B.C. government say no to a mine, given all the enthusiasm they display for that industry. Re: Release of AIR/EIS Guidelines for the Raven Underground Coal Mine project. The Comox Valley Conservation Strategy (CVCS) is a community partnership made up of 20 local environmental and residents’ groups who have come together to support a Valley-wide conservation plan. Ms. Waterman’s letter (Record, Aug. 29) doesn’t offer new information; it simply reflects the plethora of form letters we’ve all received and sites EA processes found on websites we’ve thoroughly researched. Union Bay coal hills on priority contaminated site list in B.C. The president of CoalWatch Comox Valley suggests most members of the public do not realize that coal hills in Union Bay are among 13 priority contaminated sites in B.C. that have been identified by the Province. London-based Anglo American (LSE:AAL) has joined an expanding list of coal producers making staff cuts at specific Australian operations, after it announced it will cut at least 50 jobs when its Moranbah North mine reverts back to a single longwall operation.